As a woman that grew up reading Interview with a Vampire and fantasizing about handsome pale skinned figures that could exist for eternity, I know that nothing is more exhilarating than being hunted by a vampire, except hunting one yourself. At Epic Escape Game’s Blood Thirst, you become part of an elite vampire hunting team. You must enter the room with your team and solve the puzzles leading up to finding and eliminating the most famous of all, Dracula. The story is strong and the room is well themed. The puzzles are all tied to the theme and not just your standard boxes with locks. I especially liked the use of both physical and mental challenges combining for a uniquely fun and challenging game. Note that this room’s difficulty level is Challenging so it may require some out of the box thinking. It is nice to see a company that can take a “scary” theme and make it appropriate for all audiences, yet still find creative ways to add in the fear and excitement without any sort of bloody special effects or gross decor. This room has one of the most creative puzzles I’ve seen that totally and completely ties together puzzles and story as you approach your objective. That really helps this room stand out among the standard escape games. I recommend making a whole event out of it and having your friends over to get in the mood by eating some garlic flavored popcorn while watching a few popular vampire movies ahead of time. Maybe even dress the part. Am I the only one that thinks it’s cool to show up dressed like Blade in my black leather trench coat? Okay, admittedly it gets a bit warm and confining to try to play in my trench coat, so maybe just dress comfortably. How long will your future last if you don’t escape The Fortune Teller in time? Epic Escape Game has created an incredibly innovative and fun escape room that not only can be done with your team competing against the clock, but you could actually compete against another team as well. The Fortune Teller is the first room you see upon entering the building on your right and your left. There are identical rooms across from one another. The room has a curiously captivating story about Madame Zarra and her secret. The reveal is a fun surprise. The puzzles are clever and the room is beautifully decorated. I really felt as though I had entered the room to wait for a genuine psychic complete with “woowoo” decor and traditionally recognized “reading” tools. The puzzles incorporate the themed props. They are logical. Be sure to keep your eyes open and communicate with your team in this game. Hopefully you will be in the top quarter of players to discover the secret and escape in time. The Book of Fun is missing!?!?! Oh NO!!! Grab you friends and your kids and head over to the Whimsical Library to save it from being closed…forever. This family friendly escape room in Phoenix Arizona is a wonderful beginners room and especially good for kids. The story is excitingly magical. It feels as though you’ve walked into a cartoon upon entering the brightly colored library. The energy in the room is quite spirited and fun. The puzzles do not require difficult problem solving, but rely more on observational skills, focus and patience. There is plenty to do for all ages and everyone can contribute in a useful manner. 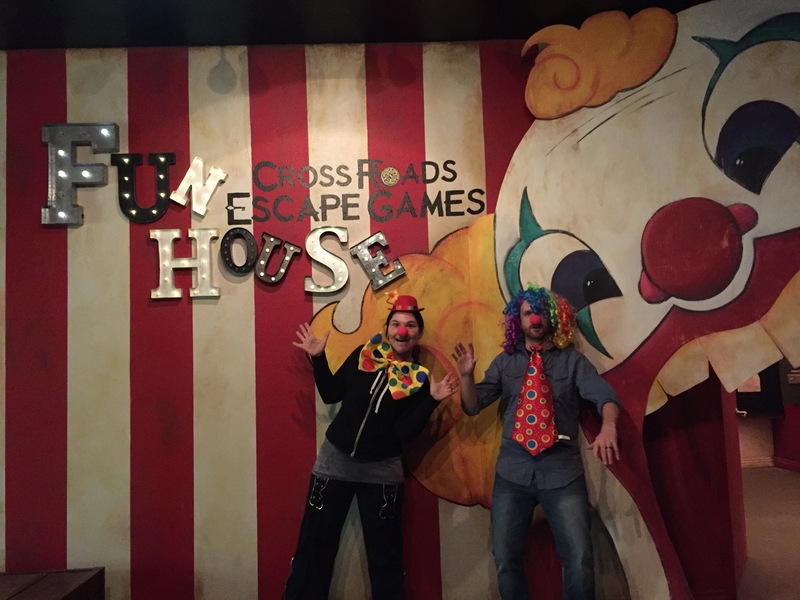 If you were one of those kids that dreamed of running off to join the circus, then this escape room is for you. Even if you didn’t dream of living among the elephants and being BFFs with the bearded lady, you’ll have a blast. This hour under the big top is sure to entertain. The puzzles are unique, creative and clever. They use multiple ways of thinking and skill sets. There are wonderful “aha” moments around every corner. The incredible immersion into the theme extends beyond the decor and reaches both the puzzle integration and hint system. But let’s not skim over the decor that easily. This is one of the best decorated rooms I’ve played. It’s impressive, especially for such a unusual theme. I played this room shortly after it opened with my husband and one of my favorite moments was when he realized he was able to open open something that he had believed to be simply decoration. His face lit up like a kid at a circus. It was so wonderful. They’ve even made a few updates since we played and I’ve heard it’s even better. This room is located in Anaheim, near Disneyland. They also have the amazing Hex Room at this location. So I recommend getting five friends and booking both rooms back to back. The Hex Room is a group buyout room. The Fun House is individual tickets so you do not need a group of friends to play. However, that means you may be playing the game with new friends that buy tickets for the same time slot as you. I’m Misha Suvorov, actor and owner of ER Games, the company that produced Haunted Recording Studio. Why did you decide to get involved in the escape room industry? One of my friends came up with idea of opening an escape room a year ago. At that time I had no idea the entire industry even existed. I did my research and liked the concept. As funny as it is, I never realized we were in the entertainment business, at least not until we opened and start getting customers. What makes your rooms unique? No one had done a Recording Studio before. Likewise, no one has done the room we’re opening right now. We always look for unique themes. Also, I believe we were the first to implement sound and visual effects to the extent we are doing, including the unique voice of a ghost itself. Not to mention the use of a live performance by a professional actor as we do for the story line. What do you think is the most important part of an escape room design? The most important part is the soul, heart and sweat invested by the owner. The escape room industry is a relatively young creative business. I think there’s still some space for unique creative work by the owners. It’s like the DNA of your brand. Who, if not you, will set it? The hired designer, engineer, constructor? I don’t think so. Besides that, finding the place is essential. Rather than create the atmosphere from scratch, I’d rather utilize something that’s already there. It becomes so authentic and real then. From that perspective, taking over a space when a previous tenant steps out of the business is a huge plus. We’ve been lucky to take over Track Design recording studio after Richard K. Allen who ran it since mid seventies. The entire atmosphere was right there. It was harder to kill it than to keep it there. Story line is of huge importance, of course. Be creative. Write stories you believe in, stories you’re involved in. Write the stories that relate to you. Puzzles should be unique, no doubt. Please share with us a fun story that has happened with your company. Uhmm, I really don’t know where to start. It’s been endless fun since we came across the idea of setting up an escape room. What I like about the escape room business, as well as the entertainment industry in general, is that it’s tons of fun! Hosting people who want to be entertained and scaring them when they want to be creeped out, all while watching on surveillance cameras – what can’t be funnier?! The most fun customer call so far was when I spent a good 15 minutes, explaining how booking works and what Haunted Recording Studio is all about, before figuring out he was looking for an actual recording studio to record his music. I was so eager to explain that he’d better gather as many friends as he can while he was trying to make it clear that it’s not his way of doing ‘this’. Even if you’re real pros – don’t forget to sink in and enjoy the atmosphere. Yeah, hitting the top score is a goal indeed, but what’s the use of it if you lose the sense of immersion in the experience down the road?! Sure! Be good, stay positive, enjoy your life! There’s so much more! 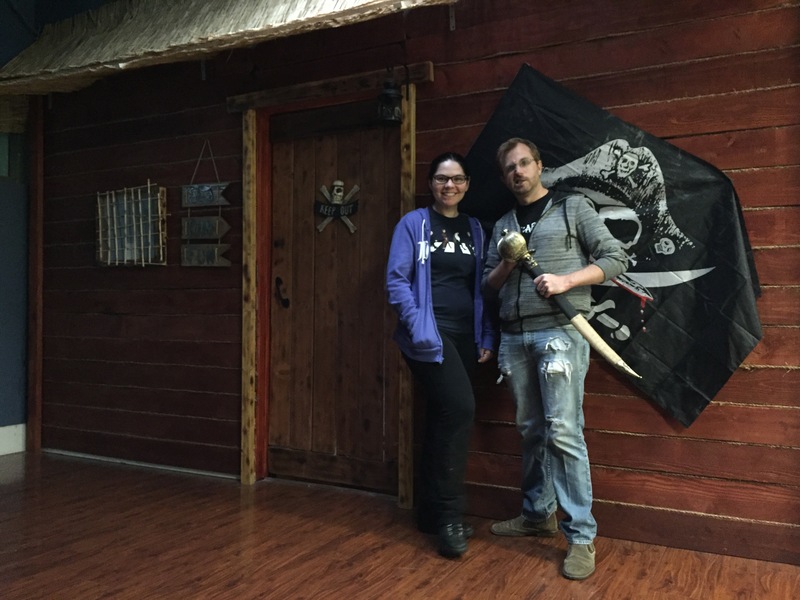 Pirate Bay is a fairly new escape room located at one of the newest Maze Rooms locations in Tarzana California, just outside of Los Angeles. This is one of the top games in the Los Angeles area in my opinion. They do a wonderful job overall. You can park in the lot behind the building then head upstairs for your adventure. The lobby is spacious and professional. The story is interesting. Not only is the room decorated to match a pirate theme inside the room, but outside as well. It is very well decorated. The puzzles are unique, creative and fun. This is not your typical room with boxes and padlocks, this is much more immersive and clever. My favorite thing about this room, however, was the fact that I wasn’t worried about breaking everything that I touched like a lot of rooms I’ve played. I don’t remember any of those horrible Do Not Touch stickers placed on objects all around the room. I actually felt like I could solve the physical puzzles “my way” and not worry about whether or not I was doing exactly what the game designer wanted. I got to be MacGyver if I wanted to and I loved it!!! I’m not saying you have to, but you won’t necessarily have a game master piping in saying, “No No Not THAT way.” I really enjoyed the puzzles and flow of the room. It felt very logical and on theme. It’s very well done and I recommend it for all ages. Hi escapers! My name is Jason Garvett and I am the owner, writer, designer, builder, and puzzle creator at Mobile Room Escape in Chicago. I have been involved in theatre all of my life including a degree in acting and directing from Emerson College in Boston, MA. For the past 10 years I have worked for a tour boat company in Chicago as a Captain, group sales manager, marketing and advertising associate, and a private party coordinator. I have loved being in the tourism and hospitality industry but had been longing to get back to my theatre roots. For my birthday my wife took me to an escape room. I was not looking forward to it at all. When we arrived we were paired with a group of 15 year old kids (“this is going to be the worst birthday ever!”). In 59 minutes and 50 seconds (we escaped!) I had more fun than I had in years. The theatricality, working together, truly being immersed in the task at hand, and the suspension of all other problems in my daily life reminded me of my years on stage. Escape Rooms were it. This was my way back into the creative realm of theatre. What makes your room unique? We basically took a 32′ x 8.5′ rectangular room and put 3 axles on it, 6 wheels, and hitched it up to a Ram 2500 pickup truck. Hence our name Mobile Room Escape. I wanted the escape room experience to not be limited to one store front location. We had our trailer custom built for us so we could take it to offices for corporate team building events, houses for birthday parties, fairs, festivals, fundraisers you name it and we are there. We also keep the trailer at Gurnee Mills shopping mall just north of Chicago for weekly performances to the public. What unique benefits and challenges do you face as a mobile game? We have had many benefits to being a mobile escape room. With the ability to travel we are not defined by just one location. We are accessible to clients in Chicago who do not have vehicles to make it out to the suburbs, and we can be in the suburbs for our customer who have no interest in navigating the hustle and bustle of downtown life. As long as our customers have roads we can go to them. We have even gone to other states to do our premier escape room “The Laboratory”. Being mobile also allows us to be just one aspect of an event as opposed to the main feature. This allows us to be a part of many fundraisers, fairs, and festivals, where large groups of people gather and we can gain more exposure along with introducing more people to the concept of “Escape Games”. Of course the challenge of parking a 32′ trailer can at times be daunting. Also the initial investment to build a trailer and purchase a truck is higher than what most escape rooms have at startup. There is also the added fun of working with local, state, and federal transportation regulations. In college I had a musical theatre teacher who hated the musical “Les Miserable”. This was one of my favorite musicals so I was very curious why he hated it so much. He explained to me that the music was structured as a modern day pop musical. He said “A musical set in Revolutionary France should have music indicative of that time period.” The music drew him out of the story. I still love Les Miserables but I do understand where professor Leo Nickole was coming from. If sets, costume, props, and story is of a certain time period and one aspect is not, it can draw the audience away from the story. I believe the same is true when entering an escape room. The escape rooms I love make me feel like I am on stage in a play. The combination of sets, story, actors, sound, lighting, and props working together is what draws me into the scenario and makes me escape reality for an hours time. One evening we had a group of 8 come to experience our escape room. A very normal fun family that loved having a great time. It turns out one of our audience members that night was the son of a camp director in Wisconsin. The director had been talking about doing an escape room with their staff for years but there were none near by. This June, Mobile Room Escape will be travelling to their summer camp in Wisconsin to put 200 of their staff members through a very unique team building. Our staff has been invited to stay overnight in their cabins, eat in their dining hall, and participate in camp activities for the week we are there. Nothing beats getting to relive your youth, while doing your job! Have fun, and don’t worry about “winning the game”. Play the game and have fun doing it. Talk to each other and share every piece of information you find, as silly as it may seem. It stinks when someone has a screwdriver in their hands and never announces it to the person looking for a screwdriver. Remember only a small part of communication is talking, the most important part is listening to each other. When I started Mobile Room Escape I thought I would just be operating an escape room. Since then I have been approached for many opportunities including writing escape rooms, building escape rooms for others, being a part of Comic-Con San Diego, and even building Mobile Escape Room trailers for other escape room owners. It has been exciting to see how starting one business venture can lead to so many others. At the end of the day my favorite part is hopping into the escape room with our customers, putting on the mad scientist costume, and watching friends, families, coworkers and complete strangers come together to laugh, struggle, and work together to complete one common goal .